Dyslexia is a reading disorder that is characterized by slow and inaccurate reading. It affects a significant portion of school age children, who have a higher likelihood for poorer academic performance and lowered self-esteem when suffering from dyslexia. Currently, the diagnosis of dyslexia lacks objective criteria, which can decrease treatment efficacy. Diagnosis relies on a discrepancy between reading ability and intelligence, a measure which can be unreliable. The purpose of this proposed pilot study was to find neural biomarkers for dyslexia using functional magnetic resonance imaging (fMRI), which then can be used in the diagnosis and treatment of the disorder. Two children with dyslexia and two typical readers were given a lexical decision task while being scanned under an fMRI machine. Their scans were then analyzed and compared to typical readers' brain activation using CCHIPS MRI analysis software. The resulting data showed that children with dyslexia had a greater spread of activation during reading tasks and more frontal and occipital activation than typical readers. These data suggest that we can differentiate individuals with dyslexia from typical readers based on their brain activation while reading. These brain differences could be the basis for possible biomarkers of dyslexia. Dyslexia is a developmental disorder characterized by slow and inaccurate word recognition and phonological deficit, which affects about 7-10% of people across most languages and cultures (Peterson & Pennington, 2012). Oftentimes, onset of the disorder becomes apparent during childhood to adolescence and can be detrimental to academic performance (Ewing & Parvez, 2012). Dyslexia can also have profound negative effects on the development of self-esteem and self-perception in children (Humphrey & Mullins, 2002). Students with dyslexia report high rates of bullying as well as feelings of isolation and exclusion within academic settings (Humphrey & Mullins, 2002). The current diagnosis for dyslexia focuses on lower accuracy and slower reading pace as compared to the expected level for the age, education, and intellectual abilities of the individual according to standardized norms (see American Psychiatric Association DSM-V, 2012). This definition relies on a discrepancy between intelligence and reading ability in individuals with dyslexia, even though the discrepancy model has been criticized for its poor validity (see Cotton, Crewther, & Crethwer, 2005; Fletcher et al., 1992; Gustafson & Samuelsson, 1999). To date, there is still an ongoing controversy and variability in the definition of dyslexia, which has led to significant diversity in the presentation and diagnosis of this disorder (Cotton, Crewther, & Crethwer, 2005). Furthermore, the multifaceted mechanisms involved in reading deficits challenge clinicians and researchers to provide accurate diagnoses for individuals with reading difficulty. However, there is no current objective biological marker in the diagnosis of dyslexia. In order to bring the diagnosis up to a similar level of objectivity found in other areas of the medical field, there is an ongoing search for a biological marker of dyslexia (Shapiro, 1999). Functional Magnetic Resonance Imaging (fMRI), which measures brain activation by tracking the brain's blood flow and volume while performing a cognitive task (Cox, 1996), can be a possible tool in identifying potential neurobiological abnormalities in individuals with dyslexia. As with other neurological impairments (see for example Borovecki, 2005 for Huntington disease), it allows for a biological analysis of the brain that is imperative in the search for an objective diagnosis of dyslexia (Shapiro, 1999). There is significant evidence, generated by fMRI, that there are neural differences in individuals with dyslexia as compared to normal readers. For example, individuals with dyslexia were found to share abnormalities in the left hemisphere temporoparietal regions, which are involved in phonological processing, and left hemisphere occipitotemporal region, which plays a part in word recognition (Peterson & Pennington, 2012). Additionally, adults with dyslexia showed less or no activation in the posterior superior temporal gyrus (pSTG), which is also involved in phonological processing (Karni et al., 2005). Furthermore, previous MRI research in the field of dyslexia has pointed at a right lateralized activation in individuals with dyslexia (Shaywitz et al., 1998). Shaywitz et al. studied 16-54 years old individuals with dyslexia and 18-63 years old typical readers who were given a non-word rhyming task. In this task the participant was required to decide whether 2 non-words rhymed or not, which involves a complex phonologic decoding. Data suggested that typical readers showed greater activation in the left inferior and middle temporal gyri and the occipital gyrus, whereas individuals with dyslexia showed greater activation in these regions in the right hemisphere (Shaywitz et al., 1998). This current pilot study aimed to observe if the hemispheric differences that were found in adults occurred in children. Since individuals with dyslexia often show signs of reading impairments at a young age, it is crucial to understand how the disorder is expressed in children in order to allow for earlier intervention and better treatments . The typical readers (i.e., ‘control' group) are participants whose reading fluency and comprehension are within the expected levels for their age and education levels. In order to examine the brain patterns of individuals with dyslexia specifically in word recognition, we used a lexical decision task which employs words and pseudohomophones (non-words that can be pronounced as real words) that examine the phonological route (Breznitz, 2006). We hypothesized that children with dyslexia will demonstrate right-lateralized brain activation as compared to left-lateralized activation in typical readers. We also expected to find less activation in the left hemisphere in children with dyslexia as compared to their peers (in line with Shaywitz et al., 1998). A difference in activation supports previous findings in adults and may indicate if biological markers for dyslexia are already present during childhood. This could allow for the development of more objective criteria used in diagnosis and more effective forms of treatment. In this pilot study, 4 participants (2 individuals with dyslexia and 2 typical readers, all aged 8-12 years old) underwent an fMRI scan while being given a lexical decision task. In this task, the participants were presented with 30 words and 30 pseudohomophones for 700 ms each (modeled after van der Mark et al., 2011). All words and pseudohomophones were (or were created from ) moderately-frequent English words. The participants were instructed to decide whether the presented stimulus was a real word or not by pushing a button box (right hand for words and left hand for pseudohomophones). Data was analyzed using the Cincinnati Children's Hospital Image Processing Software (CCHIPS) program, which was used for the post-processing of functional MRI data (Cincinnati Children's Hospital Processing Software, written in IDL, 2010). Using the CCHIPS software, we matched up the activation recorded by the fMRI (i.e., the functional data) to the image of the brain (i.e., the anatomical/structural data). This allows for Brodmann's areas, which are regions of the human brain related to function, to be identified. The total activations of the subjects were compared using t-test analysis (α = .05) that was run through the CCHIPS program. The CCHIPS program also identified the levels of activation for the different regions of the brain. 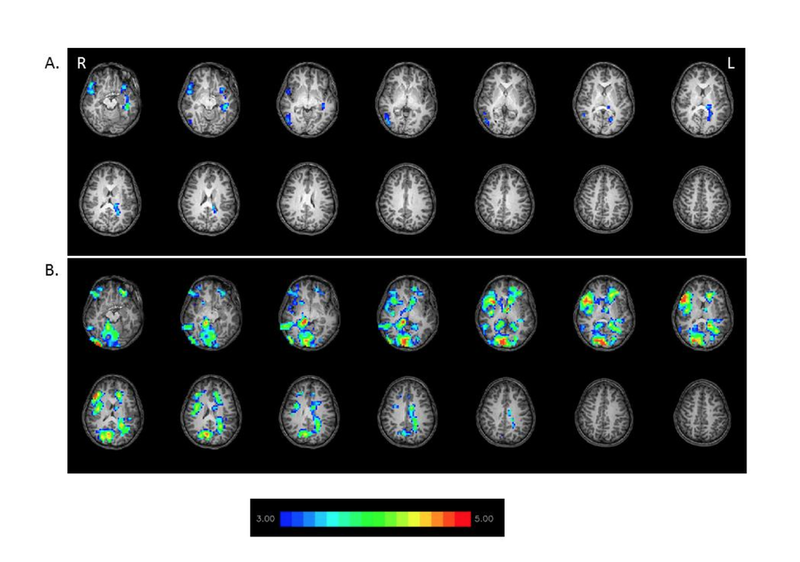 As compared to the typical readers (Figure 1.A), children with dyslexia (Figure 1.B) showed a greater spread of activation as well as a higher activation especially in the frontal and occipital regions when presented with words. Results from the t-test were significant at t=7.13 (p < .001). Typical readers had relatively more left-localized activation as compared to individuals with dyslexia, and showed activation in five brain regions including the right inferior parietal lobe, the right middle frontal gyrus, the left frontal precentral gyrus, the left insula, and the left fusiform gyrus (Table 1). Individuals with dyslexia tended towards right- lateralized and more spread activation than the typical readers. The readers with dyslexia also did not show activation in areas that were found in the typical readers group. This study aimed to find biomarkers of dyslexia by comparing brain scans of children with dyslexia and typical readers. The resulting data showed a larger spread of activation and right- lateralized activation in children with dyslexia as compared to the typical readers. Children with dyslexia also had greater activation when presented with words than the typical readers group and no decreased activation as we initially hypothesized. These differences in activation could be due to the larger effort the individuals with dyslexia undergo during reading. It might be a compensatory process to make up for different brain circuits which are used for reading in this group (Peterson & Pennington, 2012). Also, the focused-left localized activation in typical readers, which is absent in the dyslexia group, might prevent individuals with dyslexia from reading in an efficient manner. This concurs with previous studies that show there are differences in the levels of activation in certain brain regions between individuals with dyslexia and typical readers while reading under an fMRI (Karni et al., 2005; Peterson & Pennington, 2012; Shaywitz et al., 1998). Table 1: The group composite contrast (Words reading> Pseudohomophones reading). The table displays the activated anatomical regions, their Brodmann’s areas (BA), and the coordinates of these regions during a words reading (contrasted with pseudohomophones) task for typical readers and children with dyslexia. Readers with dyslexia showed greater and more spread activation as well as greater right-lateralized activation than typical readers while reading words. Another possible compensatory mechanism, which was observed in the current study, is the greater frontal and occipital activation in individuals with dyslexia than in typical readers. The greater frontal activation in individuals with dyslexia might be due to a greater effort in reading shared by the dyslexic group: they might be looking for the right words’ semantic meaning in their memory (Shaywitz et al., 2003). The greater occipital activation in this group might be due to heavier reliance on visual pathways rather than on phonological-decoding paths, which are impaired in individuals with dyslexia (Shaywitz et al., 2003). The results from this study support the ability to recognize differences in brain activation between individuals with dyslexia and typical readers, even by comparing a small group of participants. This may bring dyslexia research one step closer to having an objective biological marker for dyslexia on both a general and individual level, which will ultimately reduce the variability in diagnosis. This and other studies support the idea that dyslexia is not just a reading deficit but is also accompanied by significant differences in brain activation and comprehension, memory, and phonologic awareness deficits (Breznitz, 1997; Shaywitz et al., 1998; Stanovich, 1986; Snowling & Hulmes, 2011). However, since the current study is the pilot portion of a larger- scale study, more participants are needed in order to reinforce the findings of this study. It is important that future studies determine if the brain differences seen in this study are part of a larger trend seen in children with dyslexia. Future research can further explicate on the neuroanatomical development of dyslexia as the child ages. Additional studies are also needed to pinpoint the exact biomarkers that differentiate dyslexia from other disorders that are associated with reading deficits. As neuroimaging research on dyslexia, possible treatments for individuals with dyslexia can be studied on a neural basis. If the specific brain differences in dyslexia are identified, research on treatment programs can focus on the problematic regions of the brain and develop methods to alter the activity of the region. This will allow for treatment programs to be tailored to the specific deficits characteristic of dyslexia. For example, training on a reading intervention program that accelerates the individual reading rate improves reading among individuals with dyslexia and typical readers (Breznitz, 2006). Studies using this program showed it improves short-term memory, which in turn aids work recognition skills (Breznitz, 1997; Breznitz et al., 2013). A reading rate acceleration program can be used among a group of children with dyslexia and typical readers to compare neural activity in children with dyslexia before and after an improvement in reading skill. Further studies can reveal whether the biomarkers for dyslexia respond to treatments and whether they demonstrate a differential effect following different types of intervention. This study was supported by the Fulbright foundation, University of Cincinnati Research Grant, and The US-Israel Binational Science Foundation. Adams, SN and Engelhardt, K.M (2009). Diversity declines in Microstegium vimineum (Japanese stiltgrass) patches. Biological Conservation 142: 1000- 1010. Borovecki, F., Lovrecic, L., Zhou, J., Jeong, H., Then, F., Rosas, H.D., Hersch, S.M., Hogarth, P., Bouzou, B., Jensen, V., & Krainc, D. (2005). Genome-wide expression profiling of human blood reveals biomarkers for Huntington’s disease. Proceedings of the National Academy of Sciences of the United States of America. 102(31), 11023-11028. DOI: 10.1073/pnas.0504921102. Breznitz, Z. (1997). Effects of Accelerated Reading Rate on Memory for Text Among Dyslexic Readers. Journal of Educational Psychology. 89 (2), 289-97. Breznitz Z. (2006). Fluency in reading: synchronization of processes. Mahwah, NJ, USA: Lawrence Erlbaum and Associates. Breznitz, Z., Shaul, S.,Horowitz-Kraus, T., Sela, I., Nevat, M., & Karni, A. (2013). Enhanced Reading by training with imposed time-constraint in typical and dyslexic adults, Nature Communications. Cincinnati Children’s Hospital Processing Software, written in IDL [Software]. (2010). Boulder, CO; Research Systems Inc.
Gustafson, S. & Samuelsson, S. (1999). Intelligence and dyslexia: Implications for diagnosis and intervention. Scandinavian Journal of Psychology. 40. 127-134. Humphrey, N., & Mullins, P.M. (2002). Self-concept and self- esteem in developmental dyslexia. Journal of Research in Special Educational Needs. 2(2). DOI: 10.1111/j.1471-3802.2002.00163. Karni, A., Morocz, I. A., Bitan, T., Shaul, S., Kushnir, T., & Breznitz, Z. (2005). An fMRI Study of the Differential Effects of Word Presentation Rates (Reading Acceleration) on Dyslexic Reader’s Brain Activity Patterns. Journal of Neurolinguistics. 18. 197-219. Peterson, R.L., & Pennington, B.F. (2012) Developmental Dyslexia. Lancet. 379. 1997-2007. DOI: 10.1016/S0140-6736(12)60198-6. Shapiro, B. (1999). A Pediatric Perspective on Identifying and Helping Preschoolers at Risk for Dyslexia. International Dyslexia Association. Retrieved from Tennessee Center for the Study and Treatment of Dyslexia. Retrieved from http://dyslexia.mtsu.edu. Shaywitz, S. E., Shaywitz, B. A., Fulbright, R. K., Skudlarski, P., Mencl, W. E., Constable, R. T., Pugh, K. R., Holahan, J. M., Marchione, K. E.. Fletcher, J. M., Lyon, G., & Gore, J. C. (2003). Neural systems for compensation and persistence: young adult outcome of childhood reading disabilities, Biological Psychiatry, 54, 125–133. Stanovich, K.E. (1986). Mathew effects in reading: Some consequences of individual differences in the acquisition of literacy. Reading Research Quarterly, 21, 360-407. van der Mark, S., Klaver, P., Bucher, K., Maurer, U., Schulz, E., Brem, S., Martin, E., & Brandeis, D. (2011). The left occipitotemporal system in reading: Disruption of focal fMRI connectivity to left inferior frontal and inferior parietal language areas in children with dyslexia. Neuroimage, 54, 2426–2436.